When introducing TNRF’s Learn, Know, Act! Program: Building citizen’s voice and skills for improved natural resource governance, we decided to apply a new monitoring and evaluation approach, known as Outcome Mapping, to better help us learn and monitor the work we do so that we can more effectively achieve our goals and objectives. 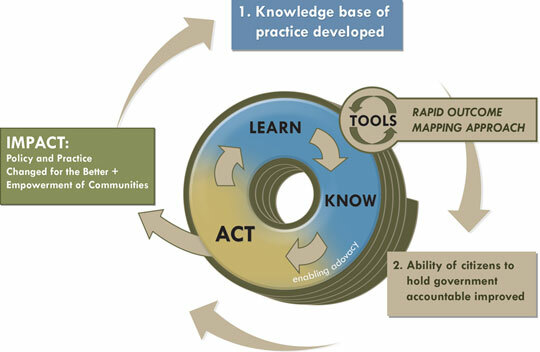 Through this approach, TNRF will monitor the learning and outcomes to feed back into the learning circle (see below), which together with other tools of information generation, sharing and management, and the development of targeted communications, will build up a knowledge base of practice within the TNRF membership. The RAPID outcome mapping facilities will be used to improve the quality and efficiency of policy engagement and dialogue, leading again to increased capacity of citizens to engage in holding government and other processes accountable and improving policy and practice in natural resources governance. 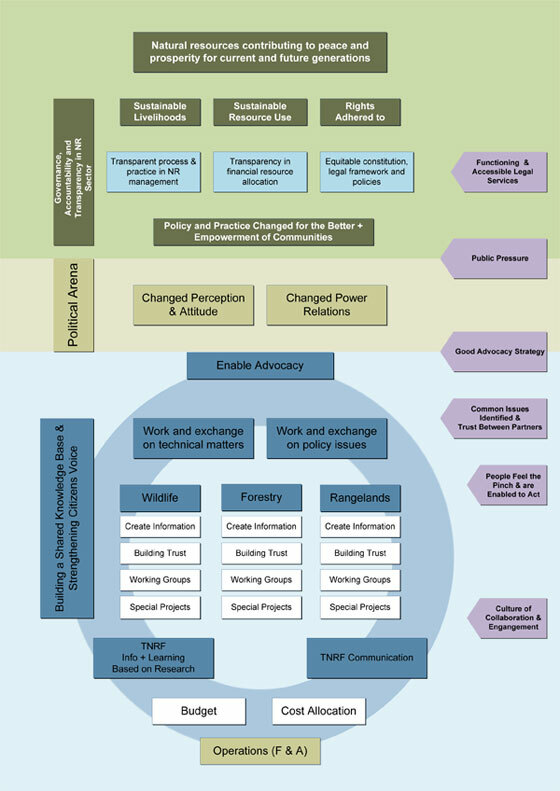 Additionally, TNRF has developed a logic model (below) to illustrate how TNRF, through the Learn, Know, Act! Program, is structured in a way for us to not only achieve our goals, but also to see how our organizational goals are linked to much broader and more robust ambitions. The logic model links the concept model of the learning, knowledge, action spiral (above) to our major strategies and desired outcomes, showing our core engagement and allowing us to track our strategies. TNRF views its financial accountability to its members, partners and funding partners as extremely important. We pride ourselves on managing and using our financial resources as efficiently and accountably as possible. We have our accounts audited annually by a fully accredited accountant (PriceWaterhouseCoopers). Our full accounts are available for any TNRF member or funding partner to examine and copy as they wish. However, we ask that an appointment is made at least one working day prior to a visit to our offices for this purpose.